Adventurousness is an odd thing to ask of a major animation studio, especially one receiving its marching orders from Disney. And yet for a few years there, around the turn of the decade, the tireless team players at Pixar took real risks—concocting a highbrow ode to fine dining, staging long stretches of wordless dystopian action, and confronting audiences of all ages with the staggering sadness of a dying spouse. Inside Out, the first new Pixar movie in two years, takes place almost entirely within the mind of a preteen girl, where five personified emotions struggle to guide her through a life crisis. Bucking the current company mandate of churning out lesser sequels and prequels, it’s not just a brilliant idea, but maybe the most conceptually daring movie the Bay Area animation house has ever produced. And that’s really saying something, what with WALL-E on the books. Looked at one way, this is a very simple story of childhood growing pains: Forced to say goodbye to her friends and the happy life she’s built in small-town Minnesota, 11-year-old Riley (Kaitlyn Dias) is abruptly uprooted when her father lands a job in San Francisco. The mundane hardships that follow—a disastrous first day at the new school, a sports tryout gone wrong—don’t unfold from Riley’s perspective, exactly. Rather, they’re experienced through the eyes of her emotions, the anthropomorphized feelings that run the control booth in her mind. Joy, a Simpsons-yellow sprite voiced by a perfectly cast (and perfectly chipper) Amy Poehler, is de facto leader of the group. But she has to share console space with the other color-coded voices in Riley’s head: eye-rolling Disgust (Mindy Kaling), skittish Fear (Bill Hader), literally hotheaded Anger (Lewis Black), and glum Sadness (Phyllis Smith). Inside Out, in other words, presents the latest of Pixar’s private worlds, those secret societies just beyond the perception of regular people. (Think Toy Story. Think Monsters, Inc. Think Harry Potter, for an off-brand example.) Heavily metaphoric, this particular universe is governed by a number of rules, most of which are explained during the necessary evil of an opening exposition dump. As Poehler reveals, through load-bearing voice-over, Riley’s personality is represented through a series of themed islands, like Honesty, Family, and the all-important Hockey. Memories, the currency of her headspace, arrive in the form of glowing orbs, colored by a particular shade of emotion. The script pokes fun at these various laws by having the characters literally consult “brain manuals”—something the audience won’t require, thankfully, as the film is mostly efficient, in that blessedly breezy Pixar way, at keeping the plot humming along. Eventually, Joy and Sadness find themselves sucked out to the warehouse-like recesses of Riley’s mind, leaving the other three emotions to run damage control from their pale tower headquarters. 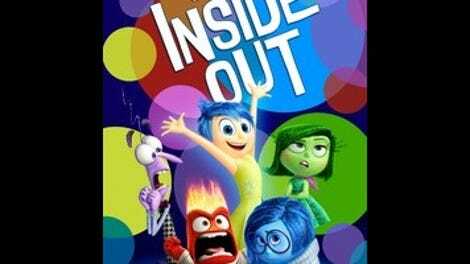 From here, Inside Out runs on parallel tracks, cleanly crosscutting between Riley’s inner and outer worlds. The meat of the movie is the buddy-comedy adventure embarked upon by Joy and Sadness, whose mismatched rapport—the former is a Leslie Knope-like go-getter, the latter an incorrigible defeatist—provides the Parks And Recreation/The Office crossover event we never knew we wanted. The filmmakers have cutesy fun with the machinations of their cerebral kingdom: A literal train of thought zigzags around the crumbling personality islands, as Joy and Sadness venture into the horror-show basement of Riley’s subconscious, get flattened by her capacity for abstract thinking, and—in the film’s most inspired gag—bumble onto the movie set of her dreams. Meanwhile, the other emotions struggle to navigate the minefield of early adolescence; one terrifically funny set piece, teased in the trailer, puts them in a stalemate with the emotions running her parents’ minds. Visually speaking, this isn’t one of the company’s most spectacular creations, nor does it fully exploit the comic possibilities of its premise. One can’t help but imagine the bustling bureaucracy Andrew Stanton might have constructed in Riley’s noggin, or the madcap mayhem Brad Bird could have wreaked. But people don’t just look to Pixar for wit and invention; they crave those little detonations of emotional truth, a hallmark of the studio’s output since Woody met Buzz two decades ago. 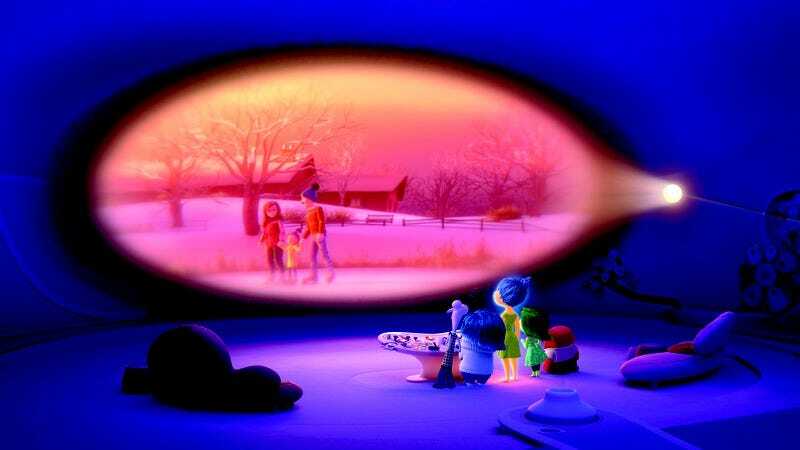 Thankfully, Inside Out is also the brainchild of Pete Docter, biggest feeler in John Lasseter’s directing stable, whose Up—the last truly exceptional Pixar movie—left no eyes dry a few years ago. Like his previous movie, his new one is chiefly concerned with the tough business of letting go, and Docter works his own special magic on the audience. His most casually devastating creation is Bing Bong (Richard Kind), Riley’s nearly forgotten imaginary friend. Part elephant, part dolphin, all tragicomic figure, Bing Bong scavenges the dusty shelves of his creator’s memory bank. He’s the most poignant symbol of what the movie is really about: the gradual, almost imperceptible demise of childhood. It’s Docter’s endgame, the final heartening point he lands on, that launches Inside Out into the upper echelons of Pixar’s filmography. The director’s after something thematically grander, a vision of adolescence that’s not so different from Boyhood, at least in the insistence that it’s life’s seemingly insignificant moments that shape who we become. If the characters are more one-dimensional than, say, Andy’s toys—most of them expressing the single emotion for which they’re named—it’s because they’re mainly moving parts in Docter’s message delivery system. And what a message: The most radical thing, perhaps, about this ambitious family film is the profound case it makes—to kids, but more plainly to their parents—that feeling melancholy is not just healthy, but entirely necessary. Sadness, in other words, is as important as happiness. That’s convenient, of course, for Pixar to say, as Inside Out will reduce more than a few viewers to hot messes. Come for the high concept, stay for the lump in the throat.